The PAX Prank | P.O.T.A.T.O. The safety division of Aperture Science (Personal Observation Testers for Aperture Testing and Observation, or P.O.T.A.T.O.) is a leader in modern safety practices and prevention technologies. Established following the famous “Lemon Incident”, P.O.T.A.T.O. is now responsible for the safety, sanity, and sanitation of all Aperture Science employees, equipment, and test subjects. As part of our ongoing mission, P.O.T.A.T.O. is required to perform regular field testing of all on-premises employees, visitors, sentient and partly-sentient equipment, legumes, tubers, non-corporeal entities, curtains, and space/time rifts for potentially harmful conditions and side effects. Our diligent efforts have resulted in classification of 63% of all tested entities being likely to not die in the next 12.5 minutes. P.O.T.A.T.O. was dispatched to the Boston Convention and Expo Center to ensure that it could be used for future Aperture Science testing. Since Aperture Science has been funneling all its remaining funding into rebuilding the Enrichment Center, the P.O.T.A.T.O. team was expected to carry out its mission independently and outside the company budget. P.O.T.A.T.O. started work almost immediately on outfitting ourselves with proper testing equipment and apparatus. We acquired hazardous material suits, clipboards, writing implements, Geiger counters, magnetic field detectors, UV lamps, PKE meters, and the like. Most importantly we were able to secure a container of Safety Implementation Devices (SIDs) and Extended Life SIDs from the Enrichment Center before they were buried in rubble. P.O.T.A.T.O. descended upon PAX East 2012 with one singular mission: Make sure PAX East 2012 was safe enough for science. As every member of P.O.T.A.T.O. knew, Safety Second, Science First! We began on the Wednesday before PAX East 2012, meeting in a secret location to discuss our testing methodology for the upcoming event. The team ended our first secret meeting with a full understanding of the test plan. P.O.T.A.T.O. held a second secret meeting the next day to distribute testing equipment and detailed maps of the BCEC. The team also acquired a Secure SID Container, with the appropriate handcuff attachment, with which to transport and deploy the fully potent SIDs. After the late night equipment prep gathering, we declared ourselves ready for testing. Whether PAX would be ready for testing or not was an entirely separate matter; one with which we did not concern ourselves. 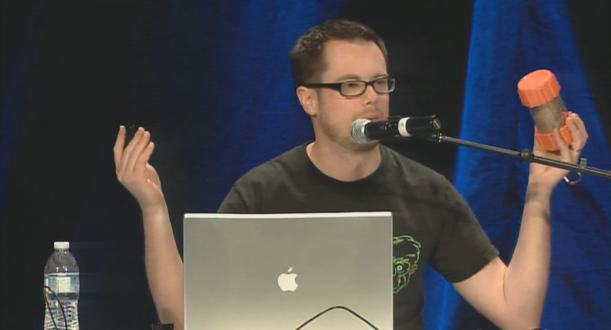 On Friday, PAX began in its typical glorious fashion with a keynote speech. While the attention of attendees was focused on the keynote and the shiny newness of the expo hall, we got into position for the public announcement we were about to make. What happened next deserves its own tale. Suffice to say that the elevator 14 shall forever be remembered as the bravest group of P.O.T.A.T.O. members to ever be stuck in an elevator during a planned testing scenario. One can read more about the elevator 14 in the words of one of their own, the brave and intrepid Decius. We give you, THE ELEVATOR 14. Once everyone arrived, our spokesperson (clickpictony) took his place in line for the microphone and the rest of us were escorted backstage in order to more easily display a show of force when our spokesperson announced our intentions for PAX East 2012. When it was clickpictony’s turn to speak, he explained to the massive crowd that P.O.T.A.T.O. had been dispatched to assess the safety of the BCEC and PAX East. The hidden team sprung into action, flowing from backstage to begin testing the PAX East Main Theater area. Clickpictony continued by attempting to asses the personal safety of Mike Krahulik and Jerry Holkins. They were deemed to be less than adequately safe, and the bearers of the SIDs (MoeFwacky and zerzhul) were brought forth in order to deploy the SIDs to Mike and Jerry so that their safety level would be increased throughout the PAX East weekend. It was decided that Mike and Jerry should receive regular supplies of SIDs as opposed to Extended Life SIDs, as the basic SIDs are actually more potent for their shorter usable life. It was explained to Mike and Jerry that they needed to keep their SIDs on them at all times during PAX to ensure their safety, and that the P.O.T.A.T.O. team would be monitoring their use of the SIDs throughout the weekend and that all PAX East 2012 attendees would be given the opportunity to participate in mandatory volunteer testing. With this, we departed the Main Theater and set off to test the rest of PAX. Throughout the rest of Friday, the P.O.T.A.T.O. team kept a close watch on PAX East, testing groups of attendees at random intervals and locations. All was well, with the exception of a SAFETY EMERGENCY! We were notified by diligent members of the team that both Mike and Jerry had been spotted without either of their SIDs! Our instant response team (IRT) rushed into action, SIDs at the ready, and found Mike without his SID on the expo floor. The IRT quickly issued Mike a backup SID to ensure his continued safety throughout PAX. Mike, however, was concerned with Jerry’s safety as well. He alerted us that Jerry was being purposefully unsafe and avoiding our attempts to re-issue a SID. He also gave us Jerry’s location. The IRT dashed over to the indicated location and were able to catch Jerry before a Safety Catastrophe occurred. They re-issued a SID for his continued use and made sure to express how important it was that he continue using his SID throughout the PAX weekend. Jerry vowed to never again be caught without his SID. The rest of Friday continued in relative normalcy. Testing of PAX attendees occurred, a few “noncompliant” radioactive individuals were removed from PAX, and safety (enough for Science anyway) was maintained. Saturday was intended to begin with an important check-up on our VIPs at their Make-A-Strip panel in the morning. However, Jerry ran across a few intrepid members of P.O.T.A.T.O. on his way to the panel, immediately brandishing his SID, clutching it for dear safety. We gave him our approval, and he continued on to the panel. Even though Jerry had shown his commitment to his safety, the check-up continued as planned to ensure the safety of Mike, as his had come into question multiple times already throughout PAX. The check-up team (clickpictony, MoeFwacky, Frugus, and DemonWolf) assembled at the mic, and patiently waited their turn to speak. They noticed immediately that in the comic itself that was being drawn by Mike, he said he feared for his safety at PAX! It was obvious that he needed our intervention. Jerry immediately produced his SID, again, as he was committed to safety in the most severe manner. Mike, on the other hand, when queried, acted insulted that we would question his own devotion to safety. He suspiciously pulled a SID seemingly from nowhere, tentatively satisfying our testers, who made sure to remind everyone to keep safety their second priority. The potentially shady circumstances behind Mike’s safety inspection forced the entire P.O.T.A.T.O. team to ramp up their testing presence throughout PAX. Many PAX attendees submitted themselves to their mandatory volunteer testing thereafter, understanding the importance of safety. The team enthusiastically handed out many extended life SIDs and safety certifications that day. Sadly, a few attendees were found to not be safe enough for science. They have not yet been heard from again. By Saturday night, the team was pleased with its coverage with the ramped up safety testing. We decided to reward our members by attending the Saturday night PAX concerts. Not satisfied with the overall safety of the concert area, one lone member of the P.O.T.A.T.O. team ventured backstage to check out the earlier sneaky incident involving Mike’s SID. He encountered Jerry, still ever vigilant in his own safety with his SID firmly attached… Mike, however, was seen bolting to a secret location in which his SIDs were apparently stored. He tried to fool our tester with his suddenly clipped SID, but there was no denying at that point that Mike was surely unsafe, and had never really taken the testing seriously. A plan was hatched… a plot devised. Finally, it was Sunday, the last day of PAX East 2012. Much testing had been done, and almost all of PAX was found to be safe enough for science. One thing, however, remained: ensuring the ongoing safety of Mike, even if doing so involved trickery. Much like Friday, although without any elevator incidents, we gathered our forces, ready to emerge when the time was right. 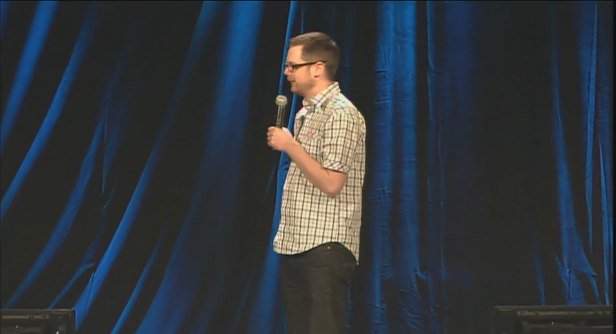 clickpictony awaited his turn at the microphone in this final Q&A session of PAX East 2012. As clickpictony started to speak, Mike immediately looked for his trick to grab a hidden SID, but none were to be had. He was caught, unsafe, in front of the entirety of PAX East 2012. He focused on the members of P.O.T.A.T.O. that had mobilized to dispense SIDs by force to the crowd, some creeping slowly towards him. It was then that he realized just how far we were willing to go in order to make sure he was safe. He got a tap from behind. Mike turned around and saw Jerry, in full P.O.T.A.T.O. 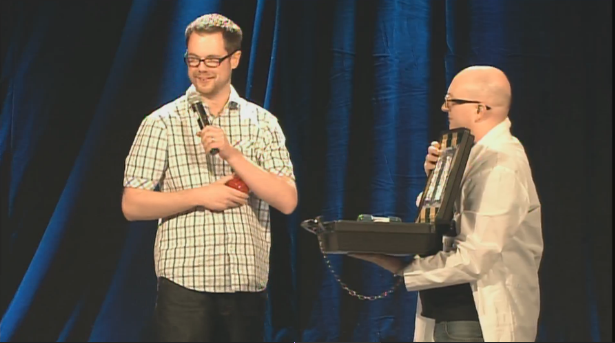 garb with the SID case in-hand, presenting him with yet another SID for his protection. At this moment he truly understood his need for the SID, and thanked P.O.T.A.T.O. graciously. 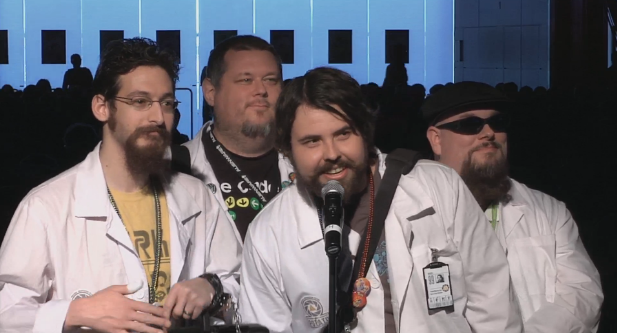 Our task complete, PAX East 2012 was declared “Safe enough for SCIENCE” (all tested entities being likely to not die in the next 12.5 minutes)!